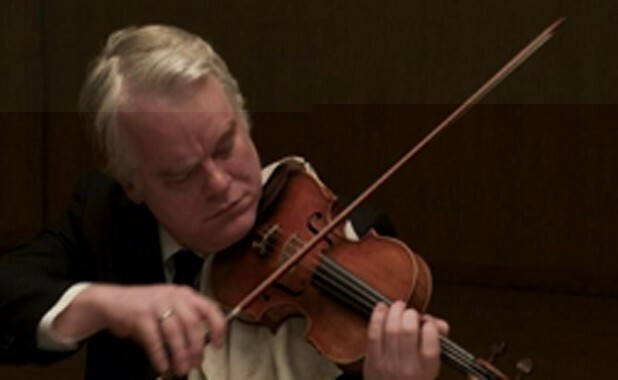 Philip Seymour Hoffman plays the violin, because he can do everything, in A Late Quartet. This week in movies you missed: No, this is not Quartet with Maggie Smith, which is slated for the Savoy Theater in Montpelier on February 15. It’s a different movie about classical musicians with an all-star cast. For 25 years, the Fugue String Quartet has won accolades all over the world. Now its founder, cellist Peter (Christopher Walken), is feeling his age. When he’s given a diagnosis of Parkinson’s disease, he realizes he’ll need a replacement if the quartet is to go on. Violist Juliette (Catherine Keener), to whom Peter is a father figure, struggles to accept his departure. Her husband, Robert (Philip Seymour Hoffman), the quartet’s second violinist, decides this is a good time to point out he’s always wanted to try playing first chair. That doesn’t go over well with the first violinist, Daniel (Mark Ivanir), who was Juliette’s first love and is currently teaching the couple’s violinist daughter (Imogen Poots). Feeling cold-shouldered by his wife and colleagues, Robert gets cozy with a flamenco dancer. Will the quartet survive the transition and make it through a season-opening performance of Beethoven’s Opus 131? You may have caught A Late Quartet during a run at the Savoy or Catamount Arts, but not in Burlington. Fans of Beethoven, string quartets and classical music generally should check out A Late Quartet. It’s a restrained, beautifully acted drama that does not fall prey to Hollywood stereotypes about professional musicians. No divas or egomaniacs here. As the offspring of two classical flutists, I found the characters and their upper-class New York milieu plausible … if a little stifling. While the characters are believable, the screenplay (by Seth Grossman and director Yaron Zilberman) doesn’t delve far beneath their surfaces. Everyone can be summed up by one dominant trait: Peter is nurturing, Juliette is cold, Robert is insecure and passive-aggressive, and Daniel is a perfectionist who needs to experience “passion.” As for Poots’ twentysomething character, she seems to exist only to give Daniel the “passion” he needs and then to guilt-trip Juliette for being an absent mother. She doesn’t make much sense on her own. Because of this shallowness, and because the quartet’s drama is pretty easily resolved, I found myself more interested in the actual music, played by the Brentano String Quartet. The film would have benefited from less classy soap opera, more music geekery. Verdict: Christopher Walken lecturing about the history of Opus 131: surprisingly absorbing. (Who wouldn’t want him for a prof?) Christopher Walken confronting his mortality: good stuff, but we’ve seen it before. A lot lately.